I sat in on this session yesterday at Convergence, presented by part of the Microsoft FRx/MR team. I personally have not yet had to migrate any clients from FRx to MR but I know the time is coming soon. The good news is, if you follow the upgrade guide provided by Microsoft with the MR software (and additional documentation which can be found in the KBs on CustomerSource and PartnerSource) the upgrade looks like a relative piece of cake. Likewise, the Microsoft folks are reporting a very short ramp to get your people up to speed on Management Reporter. The similarities between it and FRx are strong, so it should be a pretty easy transition. One disadvantage that exists right now in MR is that you can't email reports like you can in FRx. That capability may be included in future releases of MR, but that's going to be determined by the user community. The MS team reports that the focus group they use to provide input into the features that are included in the future hasn't indicated a strong desire for email capability within MR. If you're using MR right now and or are planning to in the near future, you might want to check these links. The first is a link to the LinkedIn Management Reporter Users Group. The second link is to a You Tube video posted by Microsoft on the Management Reporter tool. Thanks for the information about "Migrating from FRx to MR". We are using the GP2010 in our present company and six months back our consultants are trained us on "FRx Reporting" and we are just started using the "FRx reports" but still not well versed in making the FRx reports. I need your guidence on this which i will come back to you on this subject later. Now i would like to request you that presently i am working on Receivables Module and doing Bank Reconciliation in GP2010. Now i have given the new task to work on "FIXED ASSETS" module. Could you please guide me how should i go in FA module. Like please advice all the steps required how to book an Asset in FA and what all the steps involved all that. Shall await for your response. Vijay, I think you'll enjoy working with GP's Fixed Assets module. it's straight forward and works well. However, the question you ask is very involved for a blog post. Therefore, let me direct you to the Printable Manuals in GP. Click on the Help button in the upper right corner of the GP window, select Printable Manuals>>Financial>>Fixed Assets Management. This manual will tell you everything you need to know about the setup and use of Fixed Assets. Good luck and let us know if you need any further help! Hi Vijay, regarding Fixed Assets, there is an excellent manual on Fa that I think you will find very useful. 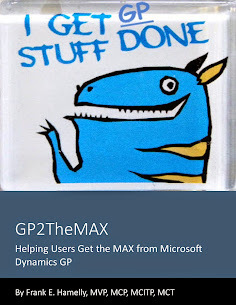 Click on the Help button at the top left of the main GP window and select "Printable Manuals". Click on Financial>>Fixed Assets. This will open a pdf manual that explains the setup and use of the FA module. I believe you'll find great guidance there. Good luck and let us know if you need anything further.